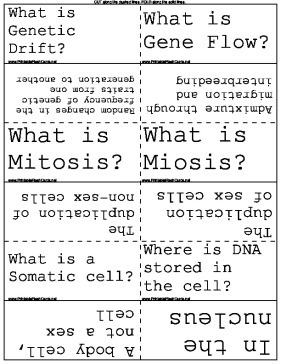 Chromosomes and their patterns are described in these biology flash cards. What is the Founder Effect? (A.K.A. Sewall Wright Effect) The reduced genetic diversity that results when a population is descended from a small number of colonizing ancestors. How did Linnaeus structure taxonomy? He gave each plant and animal a higher-level genus name and a lower-level species name. What is Mitochondrial DNA? A kind of miniature chromosome containing 37 genes that is inherited just from the mother. What is RNA? A nucleic acid present in all living cells. Its principle role is to act as a messenger carrying instructions from DNA for controlling the synthesis of proteins. What is DNA? A self-replicating material present in nearly all-living organisms as the main constituent of chromosomes. It is the carrier of genetic information. A non-disjunction is when Chromosome pairs fail to separate during meiosis or mitosis and result in an incorrect number of chromosomes in the person's genome. Darwin used Malthus's five observations, which were That most pairs of parents produce multiple offspring, an organisms population size typically remains the same, population is limited by food supply, members compete for food access, and no two members alike (variation exists).